Hasn't the CGI giant snake/monster thing gone far enough? I rented this flick while in the mood for some pretty cheesy schlock to continue my search for the worst movie ever made (this is a personal quest because no three people can agree on what is the worst movie ever). 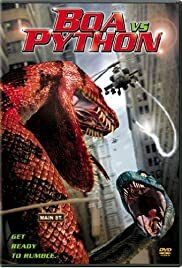 This flick combines two CGI giant snakes that previously had their own pieces of celluloid, but it isn't a sequel to either franchise. Some schmucks decided that they wanted to hunt a giant python that turned out to be a renegade human killer (big surprise). It escaped and started hiding out in a water treatment plant (another big surprise). So the government gets a woman who is working with transplants that can transmit animal brain waves and a guy with a giant boa (Houston, we have a title). So they sent this boa after the python (great idea, put two blood thirsty giant snakes in a confined area together). Throw in some special forces, idiot hunters going after the snake and you've got a movie. This was pretty crappy. Forget it unless you love the giant CGI snake thing.